[Updated] For the “first time the Opposition Leader and the Leader of the Opposition Party will not be the same individual,” OBA Chairperson Justin Mathias said, explaining that while 8 OBA MPs sent a message to the Governor to appoint Craig Cannonier as Opposition Leader, Mr Cannonier “has not yet gone through the proper procedure to become the OBA Leader” so until that changes, Leah Scott will be the Acting OBA Party Leader. This somewhat convoluted situation began on Wednesday [Sept 19], when eight OBA MPs passed a motion of no confidence in Jeanne Atherden, who was then serving as the OBA Party Leader and Opposition Leader. While generally regarded as the same thing, the OBA Leader and Opposition Leader are not, technically speaking, exactly the same thing, as the OBA leader is selected by the party, while the Opposition Leader is officially appointed by the Governor. While it is technically possible to have different people serve as Opposition Leader and Leader of the political party in Opposition, it is highly unusual for it to occur. This current situation will not a permanent one, as Ms Scott is serving as Acting Party Leader until the Party elections are held. Ms Atherden also addressed the matter in her email announcing her resignation, saying, “Under the OBA Constitution, if the Party Leader resigns, there must now be an election for a new leader. The Party Chairperson will, in due course, open up nominations and commence the selection process. “This is an important election for the OBA. It will give members the opportunity to get behind a leader who can best strengthen and unite the party and lead us according to our values and principles to represent all of Bermuda as an opposition party and government in waiting,” Ms Atherden noted. [ii] ….resignation of the OBA Leader. “I would like to take this time to thank the Leader for her work in the post and wish her the best in her future endeavours. Working closely with her as a member of the Executive I’m sure she will continue to represent her constituents concerns inside the House and out. 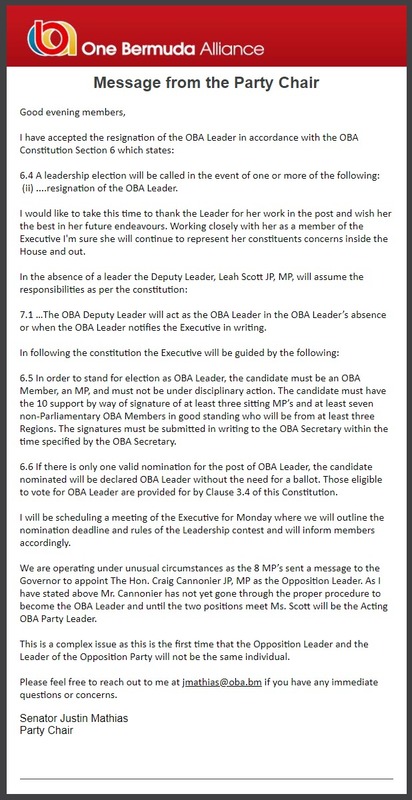 “7.1 …The OBA Deputy Leader will act as the OBA Leader in the OBA Leader’s absence or when the OBA Leader notifies the Executive in writing. “6.5 In order to stand for election as OBA Leader, the candidate must be an OBA Member, an MP, and must not be under disciplinary action. The candidate must have the 10 support by way of signature of at least three sitting MP’s and at least seven non-Parliamentary OBA Members in good standing who will be from at least three Regions. The signatures must be submitted in writing to the OBA Secretary within the time specified by the OBA Secretary. “6.6 If there is only one valid nomination for the post of OBA Leader, the candidate nominated will be declared OBA Leader without the need for a ballot. Those eligible to vote for OBA Leader are provided for by Clause 3.4 of this Constitution. “I will be scheduling a meeting of the Executive for Monday where we will outline the nomination deadline and rules of the Leadership contest and will inform members accordingly. “We are operating under unusual circumstances as the 8 MP’s sent a message to the Governor to appoint Craig Cannonier as the Opposition Leader. As I have stated above Mr. Cannonier has not yet gone through the proper procedure to become the OBA Leader and until the two positions meet Ms. Scott will be the Acting OBA Party Leader. “This is a complex issue as this is the first time that the Opposition Leader and the Leader of the Opposition Party will not be the same individual,” the email stated. On a separate but related note, OBA MP Michael Dunkley also addressed the situation saying, “I received an email message on Monday night that there was going to be a meeting on Wednesday with no agenda attached. When I asked what the agenda was I was told to prepare for the November session of the Legislature. “I was disappointed that the meeting was called with such short notice and that I was going to be off the island. Furthermore I believe the meeting was called without the Leader knowing and with the real agenda not being circulated. “While politicians are free to engage the rules and responsibilities that they have, I do not believe that the matter was handled in an appropriate, responsible, and respectful way. As we serve we must lead by example,” Mr Dunkley said. Just over 36% [4 of 11] of the currently elected OBA MPs have served as Party Leader on a full, interim or acting basis since last year: Michael Dunkley [who stepped down the day after the election in July 2017], Patricia Gordon-Pamplin [on an interim basis], Jeanne Atherden [elected by party members in November 2017] and Leah Scott [became Acting Leader upon the resignation of Ms Atherden two days ago]. The amount of those holding the OBA Party Leader position is likely to change again following the OBA leadership election. So as the situation stands now, Jeanne Atherden has resigned as Party Leader, Leah Scott is the Acting Party Leader, it is unclear who, if anyone, is currently the Opposition Leader, Craig Cannonier is expected to be sworn in as the new Opposition Leader on Monday, and the OBA will be holding a leadership election. Mr Cannonier has now been sworn in as Opposition Leader, Leah Scott remains the Acting OBA Leader, and Justin Mathias has resigned as OBA Chairperson. all talk and no action as Granny used to say. Just get on with it or quietly go away. Not the first that should have. And I repeat – THE PEOPLE OF BERMUDA SPOKE! Just like our neighbors to our west recently did , eh ? Doesn’t matter what the UBP/OBA won!!! They will never win again in your life time and that coming from someone that voted for UBP and later OBA. You will never convince a certain segment of Bermuda to swing votes. Point taken from last election. People in the UBP called the PLP racist, but it’s the majority of black Bermudians that swing votes from UBP/OBA to PLP. The only reason why the UBP and OBA won over the years!! The only a small group of white Bermudians swing to PLP and the truth be heard… when we do our own race stops speaking to us….and we than call the PLP racist because we lost which is wrong!!!!!! Although that might be true now it’s annoying to people who remember that election hearing people like OJ constantly trying to re-write history claiming that the 2017 election was the biggest landslide in Bermuda’s history . And the correct numbers are in fact . Sounds to me that he’s the Leader-Designate. Why make it sound so confusing? Only in a third world country is someone the leader designate after a palace coup. Cannonair has not been elected party leader, so unless OBA plan to throw all semblance of democracy out, they need to hold a leadership election. It is my view that the wheels of the OBA bus started to come off with the leadership of Craig Cannonier. Why would the 8 OBA MP’s support him as the leader in the HOA. Have you all collectively lost your minds? In his own words he says that he “was less than transparent” in the Jetgate FIASCO which is still under active police investigation according to a source. What does that mean? He wasn’t telling the truth? OBA, WHAT ARE YOU DOING? Do you wish to self destruct? Please someone else step to the wicket! He may not be a colt anymore, but he should not be selected to lead the team and in my opinion should not even be an MP. Well ya running low on likeable Surrogates. UBP turn OBA voters.. are you behind Cannonier.. While I agree with the suggestion of a completely new party (if enough talented and sincere people could be found to get involved ) the problem is that ANY new party , regardless of who is or isn’t in it , would promptly be tarred as ‘a another/new UBP’ by the PLP. And it would be swallowed hook ,line and sinker . And they would fail . Well you cant blame people for thinking like that, for 300 years we were under a racist regime and we’re still traumatized by the undeserved privileged recipients and their ideology. You didnt complain when you benefitted economically and socially from your past, so now deal with the concequence. Sorry , but your boo hoo stories with massive generalizations have no effect on me at all . I’d be willing to wager anything that you live a life of pleasure and luxury the envy of 75% of the world’s population and far better than mine . And like Oracle said below , all created by the evil UBP . Of course you’ll still be a gov’t employee 5 years hence but let us know how wonderful things are for the rest of the island then . And you always talk out of your backside. Again, pot meet kettle. 25-11 tho right? Lmao. We’re all traumatised by how stupid ypu are. The UBP created one of the greatest middle class economies in the world. One that was enjoyed by both blacks and whites. This middle class, started it’s dreadful steep downward trajectory under the leadership of Dr. EB with cog in the wheel Paula as his sidekick. I would welcome the UBP back as it was the BDA faction that caused the OBA to fall from grace. The BDA should never have merged with the UBP. That is what my Craig is trying to fix and fix he will. They just need to start their own party and forget the OBA/UBP all together. Justin’s immaturity is showing. Obviously there are interim leaders during a transition process. The Party leader is elected prior to being selected as Official Opposition Leader..
Why couldn’t the OBA wait for the process.. I don’t get it! If only the Governor can swear in an opposition leader, which has not happened yet, and Leah Scott has been sworn in as deputy leader then you only have one leader! A deputy leader! He’s making it sound so confusing isn’t he?! Dunkley, your arrogance lost the election. Your current arrogance allows you to believe that people still want to hear you speak. Do you not realize that your words did enough damage when you were Premier? Now you are trying to undermine your own party? I bet that you are arrogant enough to think that you can be leader of the opposition. NO, No, No. Be quiet please. Concentrate on your milk business. Just resign from politics. Until these guys like Dunkley go, the OBA is non-existent! It is normal to have an interim leader until a permanent leader is in place. Justin, why do you seem to be making this so complicated. Scott will act, until Cannonier is permanent. Did you really have to go through all of this extra publicity? You need some more mentorship. Hi Rhonda, I am not a fall in line type of person. I do however have ideals and preferences. I do believe that Cannonier has Bermuda’s best interest at heart. It must be so hard to try and do the right thing with so much backlash and opposition from people. It would be nice if he had his original group from his initial party, Bermuda Democratic Alliance, was it? I support a one Bermuda, but some of the people who jumped on the bandwagon had more of, self interest. Hopefully Cannonier is more wise and not as naive as before. Tricky game, this politics. The reality – MP Leah Scott is the Acting Leader of the OBA until further notice. Unless MP Atherden has resigned as Opposition Leader, she remains in post until otherwise notified by the governor. Politically, can we assume that all OBA MPs voted for MP Cannonier to be Leader of the Opposition except MPs Dunkley, Atherden and Scott? Under the circumstances, the OBA leadership status sets a very poor example for Bermuda. Let’s hope they get themselves sorted out asap! It is interesting that MP Dunkley is criticizing the actions of his other MPs. Will we see him resign and force a bye election or do the typical ‘tail between the legs’ and fall in line in order to retain his public mouth piece? It is clear that any hope he had to return to leadership of the OBA is passed its ‘sell by’ date. Some sometimes refer to Matthias as ‘Senator’ but I thought he gave his parting speech as a Senator earlier this summer. Identify Charlie , and you will find the true leader of the OBA . No one seems to know who he is , but trust me , ” He rans things around here . ” Are you Charlie ? Cannonier needs to choose his team well, strategize and stop trying to make everyone happy. He needs to pick a team that he can trust as he has had enough time to think about this. Please get it right this time. Bring back the likes of some of your most trusted confidents, the time is now! Omit MPs Dunkley, Moniz and Atherden from his shadow team and make changes in the Senate? MP Atherden already trumpeted the all female OBA team. Will he want to mess with that? Will the Oba ducks get in line and vote Cannonier in as OBA Leader..